It's important to get this right. Here's how. Recently, a few indoor cyclists and instructors have asked me how they can make indoor cycling more of a full body workout, perhaps by using handheld weights or doing abdominal exercises during the ride. This interest undoubtedly stems from what certain venues are doing: SoulCycle, for example, incorporates moves with lightweight dumbbells at the end of the workout; Flywheel has riders use a lightly weighted bar to do bicep curls, overhead presses, triceps presses, and the like, toward the end of the ride; and various boutique studios have people doing push-ups against the handlebars or other upper body moves. While I applaud people’s desire to get a full body workout, an indoor cycling class isn’t the right time or place for it. Here’s why: For one thing, it’s hard enough for many indoor cyclists to maintain proper posture while riding so if you add handlebar push-ups or bicep curls or overhead presses with weights to the equation, it’s a set-up for injury (especially to your back, neck, hips, or knees). 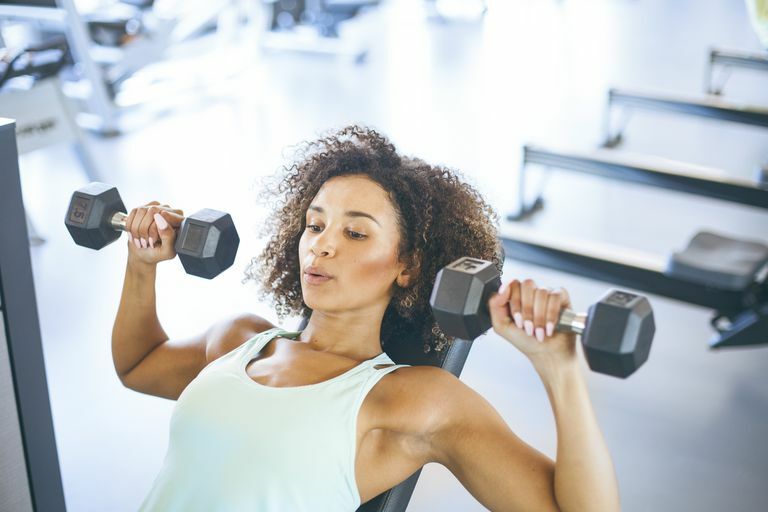 For another thing, lifting light (1- to 5-pound) weights for many repetitions won’t build muscle mass or strength; you need to use heavier weights and do fewer reps to challenge your muscles appropriately. As for the notion that you can get a true core workout by doing specific breathing exercises, as I’ve heard some instructors claim, that’s nonsense. Yes, you’ll be allowing your abdominal muscles to contract and expand but moving against air alone isn’t going to build or tone those muscles. You need resistance for that. The same is true for your arms: While you can tone your upper arms and other common trouble spots slightly during an indoor cycling workout, you’re not going to build major muscle power or chiseled definition with indoor cycling even if you were to lift light weights on the bike. None of this means you can’t make an indoor cycling workout a full body workout. Your best bet is to spend 10 to 15 minutes after each class doing exercises that target the area you specifically want to work on; this way, your total workout would still be just an hour long, assuming you took a 45-minute cycling class. That’s time well spent! If you want to get a good upper body workout: Save it for after class when your body is fully warmed up. Head to the weight area of the gym where you can perform a variety of upper-body strength-building exercises properly. If you want to truly strengthen your core and build muscle definition in your abs: Do various versions of the plank (front plank, side planks, plank towers, and so on), along with other results-producing ab exercises. If you want a minimal but effective well-rounded upper and lower body: Stick with basic weight-training exercises. That means squats, chest presses, deadlifts, leg presses, lat pull-downs, triceps push-downs, and the like. Another option that's available at some health clubs and boutique studios: Hybrid (or fusion) classes where you can get an indoor cycling and a yoga (or Pilates or sculpting or mat) workout rolled into one class. These usually have pretty close to a 50-50 ratio of cycling to another exercise format, for a total of 45 to 60 minutes (in other words: 25 to 30 minutes of cycling, followed by a similar amount of the complementary workout). The goal with these classes is to give you two workouts in one but the crucial detail is the “other” workout (yoga, Pilates, abs, and the like) is done off the bike. And that’s the way it should be for safety and effectiveness. How Can You Lose Weight With Indoor Cycling?